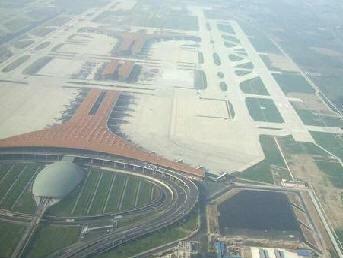 November 30, 2009 - The third runway at Beijing Capital International Airport (BCIA) became operational on 29 October, easing the traffic pressure at the country's busiest airport. "The airport handles 1,100 arrival and departure flights every day. That will probably rise to 1,500 to 1,600 and peak at 1,900 during the Olympics next year, so the third runway is much needed, " said a BCIA spokesperson. This new runway, which is equipped with an advanced landing guidance system and is 3,800 meters in length and 60 meters in width, passed the appraisal by the General Administration of Civil Aviation of China (CAAC) on October 20 and went into use as scheduled. "The new runway is able to accommodate the largest airliner in the world, the Airbus A380," said airport general manager. It is part of an expansion project that includes a new terminal building, 100 new aprons, a cargo zone and auxiliary facilities. The project will enable the airport to accommodate 60 million passengers and handle 1.8 million tons of cargo each year. The new terminal building is expected to come into use in February 2008. Meanwhile, the civil aviation authority has submitted a proposal for the site of the planned second Beijing international airport to the central government for approval. "The preliminary site is to the south of the city and near the Yongding River," said a CAAC official. "Beijing has reserved Lixian Town in Daxing District as a candidate site," said Shen Baochang, Communist Party secretary of the district. In the past, there had been speculation that the new airport might be built in Langfang, in neighboring Hebei Province, or in Tianjin Municipality or at the Nanyuan Airport in Daxing District. "Lixian Town, in the jurisdiction of the capital, is in the plain area of the Yongding River, with easy access to expressways leading to downtown Beijing. It is ideal for a large international airport," added Shen. "Nanyuan Airport is currently used by both civilian and military aircraft. Its infrastructure is old. It is near the fifth southern ring road and is too close to the downtown area," Shen said. Location surveys for the new airport site were conducted in 2002 and 2003, but the scheme was suspended when it was decided to expand the BCIA first. "When the location plan was approved by the central government, the CAAC will conduct a feasibility research," said the official from the CAAC. Experts believe a second airport will greatly boost the economic development of the whole Beijing-Tianjin-Hebei area. Beijing Capital International Airport is the main international airport of Beijing, China. It is located 32 km northeast of Beijing's city center in an enclave of Chaoyang District that is surrounded by rural Shunyi District. The airport is owned and operated by the Beijing Capital International Airport Company Limited, a state-controlled company. The airport's 1999 extension (Construction of Terminal 2) was financed by ODA (Low interest loan) provided by the Japanese government in return for renouncement of war reparations. The airport's IATA Airport Code, PEK, is based on the city's former romanized name, Peking. Beijing Capital has rapidly ascended in rankings of the world's busiest airports in the past decade. In 2001, the airport served 24.18 million passengers and was ranked outside of the Top 30 in the world by passenger volume. By 2008, passenger volume had more than doubled to 55.94 million, making Beijing Capital the 8th busiest airport in the world. In 2008, the airport registered 431,670 aircraft movements (take-offs and landings), which ranked 21st in the world, making Beijing Capital the only Asian airport in the Top 30. In terms of cargo traffic, Beijing airport has also witnessed rapid growth. By 2008, the airport had become the 18th busiest airport in the world, registering 1,365,768 tonnes of cargo. In 2009, for its annual World's Best Airport Award, Cond? Nast Traveler magazine awarded World's Best Airport to the Beijing Capital International, based on its multi-criteria satisfaction survey, including factors such as cleanness, speed of security/immigration clearance, clarity of signs, luggage handling, etc. It was the first time that Beijing Capital even made to the top contenders list.